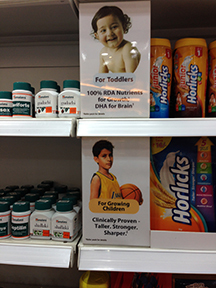 Coming back through Delhi airport this weekend I noticed this promotion for GSK's Junior Horlicks in the Guardian Pharmacy claiming: "100% RDA Nutrients for Growth, DHA for Brain." I thought all promotion of foods for children under 2 years is stricly banned in India. Since GSK has now joined GAIN perhaps we can expect more of this. One good piece of news about GSK however - it has sold Ribena and Lucozade.